Swap Meet Sunday always starts the same for Duane and me every month. We rise at the ungodly hour of 3 am to begin our day. By 3:30 we’re out the door to hit Circle K for refreshments and ice, then pick up our buddies Alex and Renato Cardone. They always bring a plethora of random items to sell. I think of them as eccentric hoarders, but they consider themselves pickers. Whatever you want it to call it, the things they bring to sell typically come in the shape of odd, rusty and sometimes valuable. We arrive at the Long Beach Veteran’s Stadium premium reserve gate by 5 am, and I always feel the same way: tired and baffled. Why does one have to wake up so damn early to sell motorcycle parts? Accessibility for the Swap goes as follows: premium vendors are allowed in at 5 am, reserve vendors begin to enter at 5:30 am, finishing with non-reserved vendors by 7 am. The Topping Events staff goes above and beyond every month to get everyone in their spaces before the public gates open at 7 am. The So-Cal Cycle Swap Meet has provided small businesses the opportunity to build their brands since October of 1997. It’s a well–oiled machine, currently owned by Marshall Topping and Jason De La O, with Jordan Griffin managing the staff. This family-friendly event is very well known, so it’s normal to see over 500 people waiting for the gates to open. The bike corral and general parking lot are usually at full capacity by 8 am. Our ritual for our booth is the always same. Pull up to space #801, set up the booth, and make sure Duane and the Cardone Brothers price their inventory. This small effort allows all of us to work the booth and come and go as we please. Then we begin to greet our extended family with hugs and handshakes. We normally utilize this time to catch up with them before the main gates open. For others, it’s finding the hidden gems before the public has a chance to purchase. Mike Deutsch, aka “Otto,” is normally buzzing around on his skateboard to beat the other guys to the punch. He’s one of the best pickers I have ever had the chance to meet. What I see as rust, Mike sees the potential. He capitalizes on every purchase made. The four of us have our missions for the day. Duane searches for old leather tools and vintage motorcycle magazines. Alex and Renato focus on rare parts for their never-ending custom products. I tend to spend quality time with our advertisers and look for potential content for the site. This normally entails walking out to the bike corral sometime during the day. Here’s my tip for finding our style of bikes in an overwhelming sea of baggers: look for the Biltwell helmets. It helps separate them from the herd. The bike corral is a sun-filled, open, parking lot so I normally seek refuge in Helmet Division’s booth afterward. Roy Kawahara and Rene Chavez sell vintage helmets, provide custom helmet relines, and always have cold Dr. Pepper. I love these guys! From there, I normally visit Vintage Klass’ booth to hear about Mary and Joel Klass’ vintage finds. If you like rare, unique, vintage goods are sure to visit their booth. You won’t be disappointed. I don’t normally walk the 500,000 sq. Ft. Swap Meet, as I like being by our booth. It’s where I get the chance to meet fellow members, followers, and future DB Custom Leather, customers. 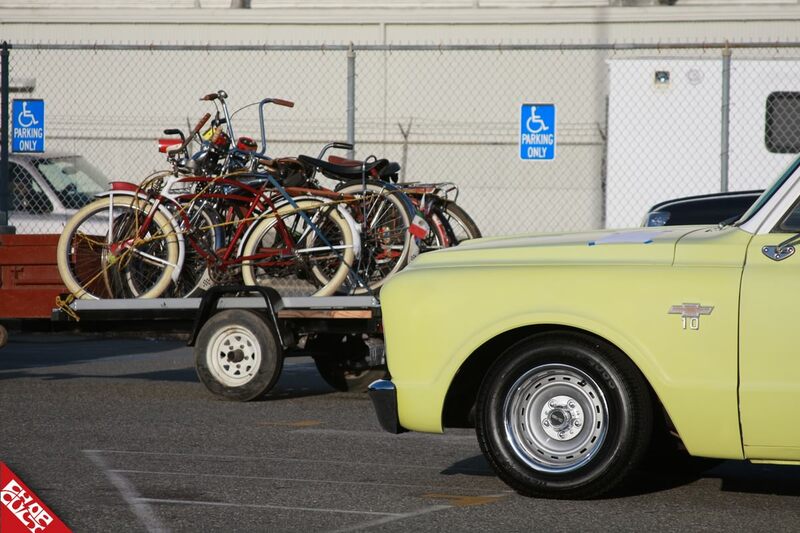 The So-Cal Cycle Swap Meet caters to anything cycle related. This does throw a wrench into our scene as 30 percent of the vendors cater to bicycles. I admit some of the bicycles are cool to look at, but I’d prefer to see more motorcycle related vendors. Duane and I prefer to set up in the back section of the swap. This is where you'll find great companies like Dice Magazine, Biltwell, Speed Merchant, Cycle Zombies, Lowbrow Customs, Sunrise Cycles, Dago’s Speed Shop, Mindpill, Burly Brand, Swazi Mike, Noise Cycles, Lady Hump, 24 Cycles, At The Risers, Show Class Magazine, Negotiable Tim, and many more. The general public normally fills our end by 8 am, bartering is in full effect, and I’m working the booth for the rest of the swap. The main gates close at 1 pm. We normally shut down our booth by noon to grab some lunch and head back home. Some vendors go home with cash in their pockets; others go home with potential sales and leads. We also take home the priceless gift of quality time spent with family and friends. For me, this gift is more valuable than any high dollar motorcycle part on the premises. Duane and I end Swap Meet Sunday by dropping the Cardone boys off with their finds and left over parts, put away the booth, and are normally napping by 2 pm. All in all, a day that starts off pretty bleak ends with a smile and happiness. I hope that your local swap meet provides the same service for you. If not, find one that does. We'll be attending this weekend's swap so be sure to swing by the booth! 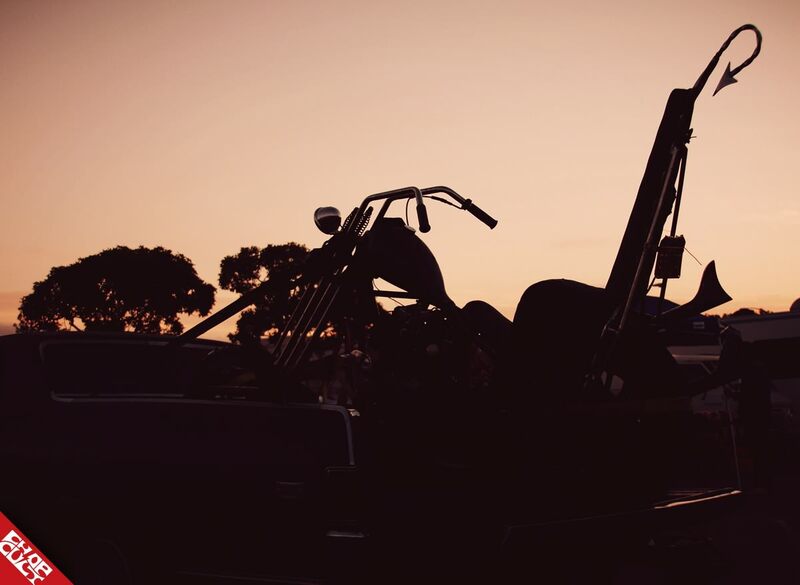 We appreciate Topping Events’ dedication to the motorcycle enthusiasts, the industry, and the ChopCult community. Check out their website for upcoming dates, sign up for your own vending space, and follow them on Facebook and Instagram. hold the phone, the socal swap meet is once a month??? lisa it was very nice to meet you last weekend and thank you so much for the sponsor kiit for my boy Vincent he wore that chop cult hat all day! thanks for all you guys do for our chopper community and pointing out that it starts with the family coming out and enjoying the swap meet. Popped my cherry last weekend at the swap meet. Tons of stuff to see but patience ran out in the heat of the day. Gotta go again to see what I missed. Went over to the Coffee Cup Café and ate a great Breakfast, super good!